Life with missing teeth is certainly no picnic, and the same could be said if you’re currently dealing with an unreliable denture that constantly slides around in your mouth. At Total Dental Care, we’re able to fully reverse any degree of tooth loss to give our patients the beautiful and functional smiles they deserve, and we’re often able to do it with custom-made dentures. Combining art, science, and the most advanced materials, Dr. Robert Miller is able to create strong and natural-looking dentures that enable our patients to eat, speak, and smile with complete confidence again. 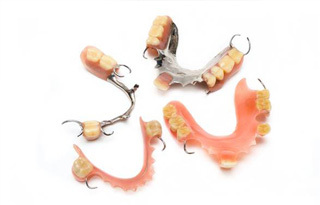 Partial Dentures: Sometimes simply referred to as a “partial,” this type of removable prosthetic is designed to replace any number of consecutive or nonconsecutive teeth along a single dental arch. Porcelain teeth are bonded to a gum-colored base that is specially shaped to fit each patient’s unique dentition like the piece of a puzzle. To stay in place, partials have small metal clasps that loop around neighboring healthy teeth. 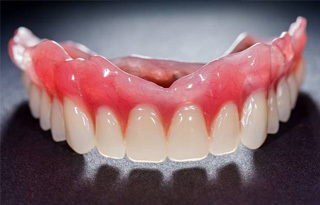 Full Dentures: This is the kind most people think about when they hear the word “denture.” Similar to partials, they consist of prosthetic teeth attached to a gum-colored base, but they’re actually designed to replace an entire row of teeth. The base is a little thicker than a partial, and they actually sit directly on the gums using natural suction and/or a bit of denture adhesive. Implant-Retained Dentures: While these dentures look like traditional ones on the surface, what makes them special lies underneath the gum line. The prosthetic teeth are held in place using multiple dental implants that are anchored within the jawbone, giving them a fit and security a removable prosthetic simply can’t match. Even better, because the implants themselves stimulate and provide support for the jawbone, they also help a patient maintain the overall shape of their face. This is the ideal option for someone with an unstable denture who’s looking for an upgrade. Dr. Miller can help you choose which type of denture is the best fit for you at an initial consultation. At this appointment, he’ll perform an oral exam and take some X-rays before giving you his recommendation. If you choose to get a traditional denture, the process will consist of you trying on a number of different models in order to find the perfect look and fit. Once you’re completely satisfied with how everything feels, the model will be sent to a dental lab to fabricate your final dentures. 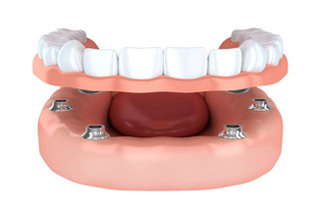 Or, if you choose to go with an implant-retained denture, Dr. Miller will schedule you for the placement procedure. In the end, no matter which type of denture you choose, the end result will be the same: a set of teeth you can truly rely on. Dr. Miller prides himself on being able to create the perfect denture for every patient, and he’s ready to do the same for you. 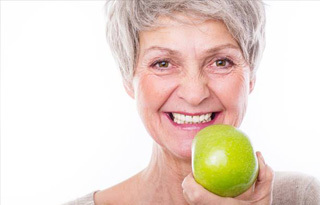 To learn more about your denture options and schedule a consultation with your Forest Hills dentist, contact us today.